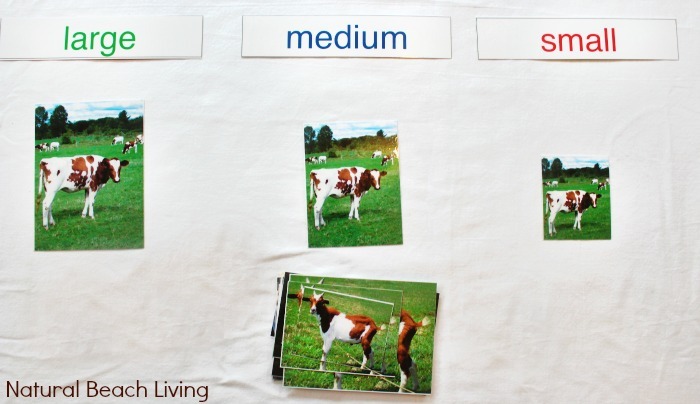 Farm activities are one of our favorite themes. If you haven’t added the farm to your homeschooling or your school shelves you should definitely try it out. There are so many activities to do, so much to learn and so much to experience down on the farm. 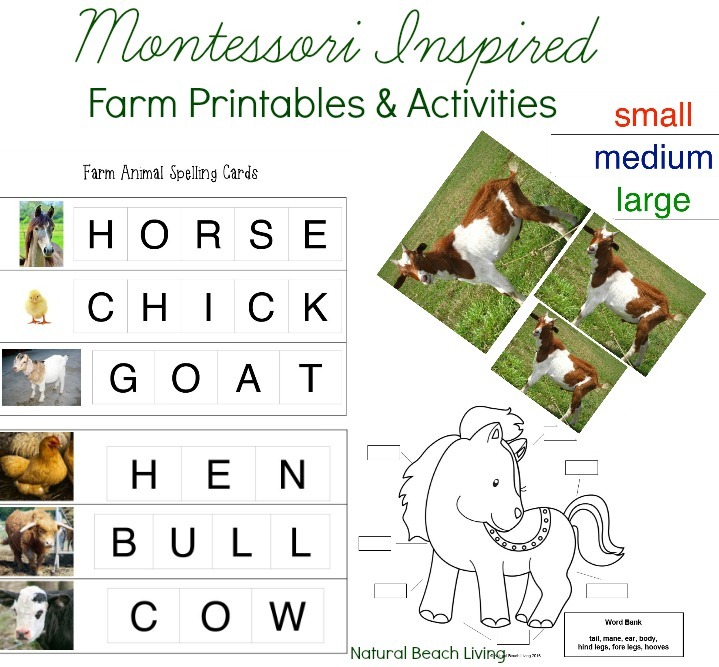 Today I am sharing a few Montessori Inspired ideas that we have added to our farm themed week. 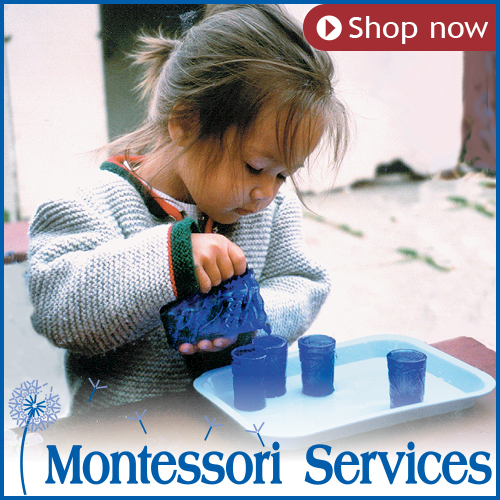 If you aren’t familiar with Montessori or don’t normally incorporate it don’t worry. 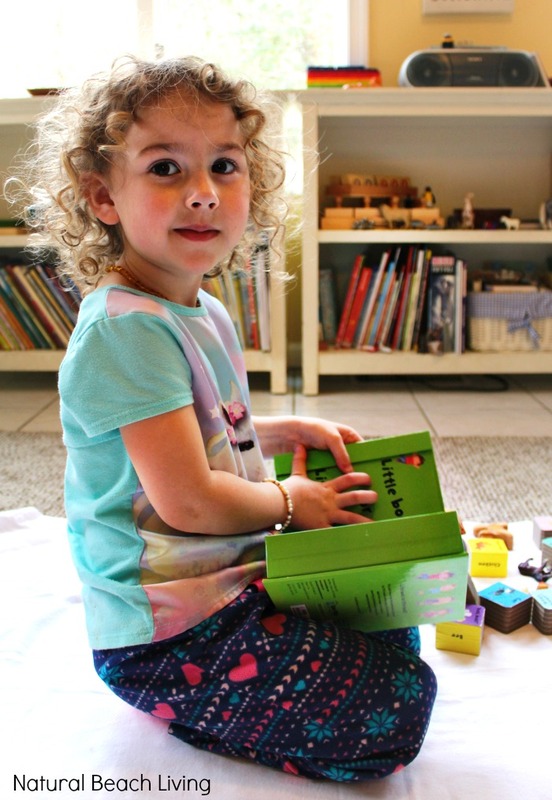 These hands-on learning activities are fun for every child and I’ll share easy ways to do them. We started our unit study off with talking about the farm and then reading great farm themed books. We love Non-fiction books for the most part, but some of the early fiction readers can be a lot of fun for this theme. Mrs. Wishy-Washy’s Farm was part of my sons favorite series when he started reading. 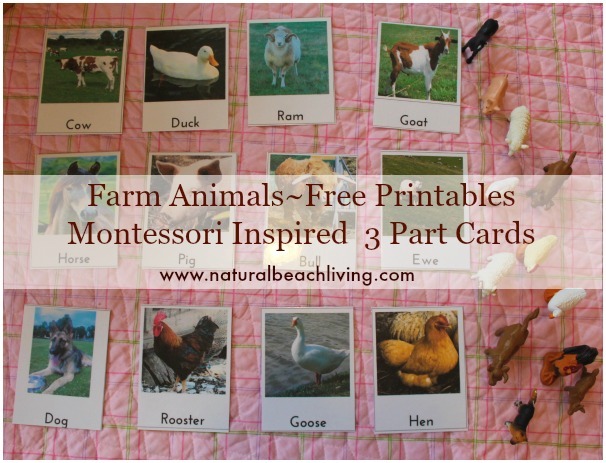 Last year we explored farm animals and animal matching with these Montessori 3 part cards. That was a lot of fun, so we brought them back out for this week. 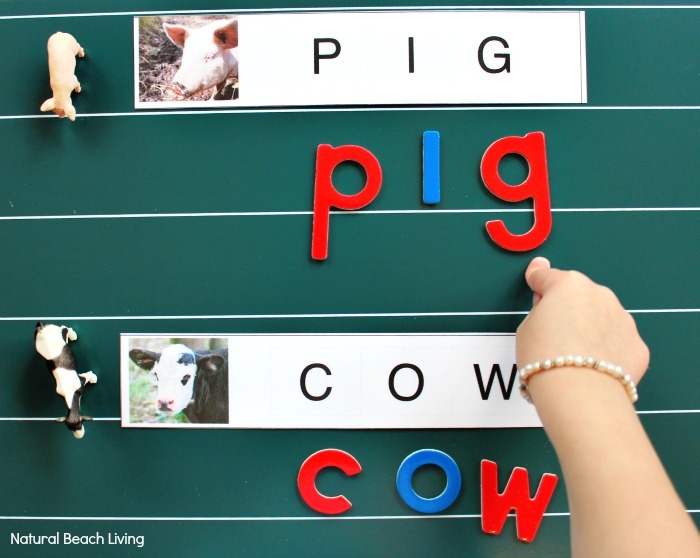 These Farm Spelling Words are wonderful! You can use these so many different ways depending on your children’s level. Here we used them for letter matching (capitals to lowercase letters). 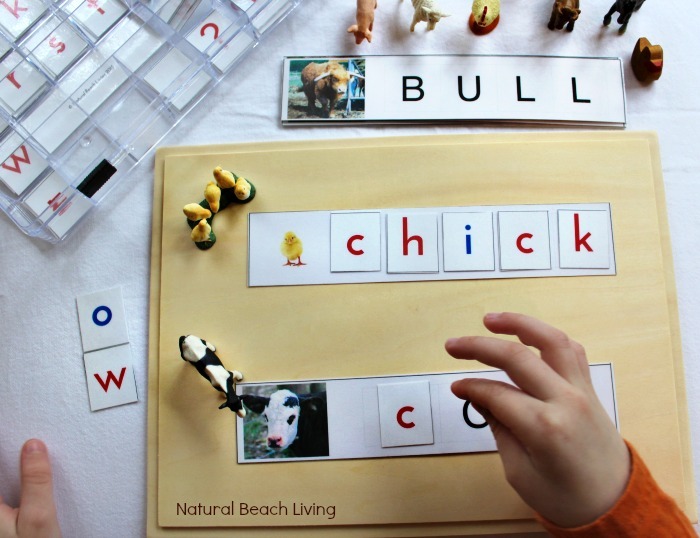 You can also use these cards for your children to write the words. Working on their handwriting skills and fine motor skills. Place the cards on a tray with blank paper and a pencil for them to see the word and copy it. Or if your cards are laminated (which I think is the best) they can even write directly on the cards (using a thin washable marker) and then wipe them off afterward. You can Download your free movable alphabet printables here. 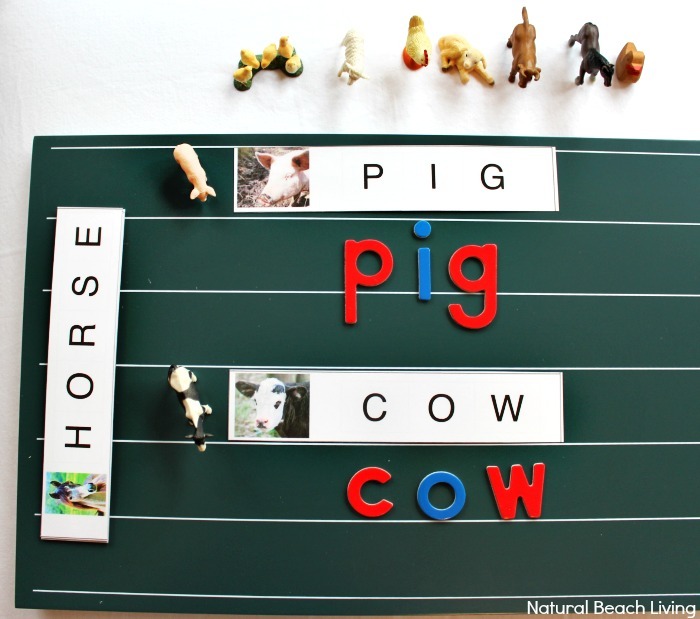 Farm Animal words with Montessori Movable Alphabet. 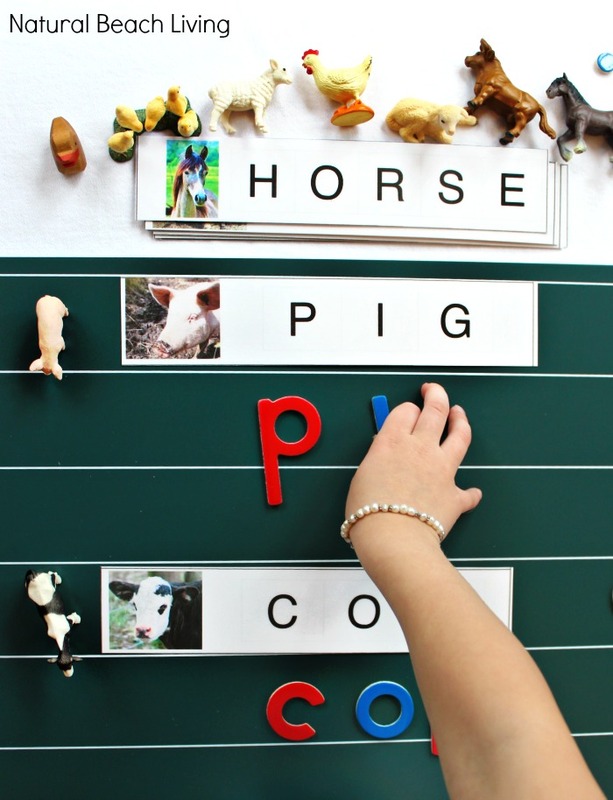 Pointing to each letter and saying the sounds. 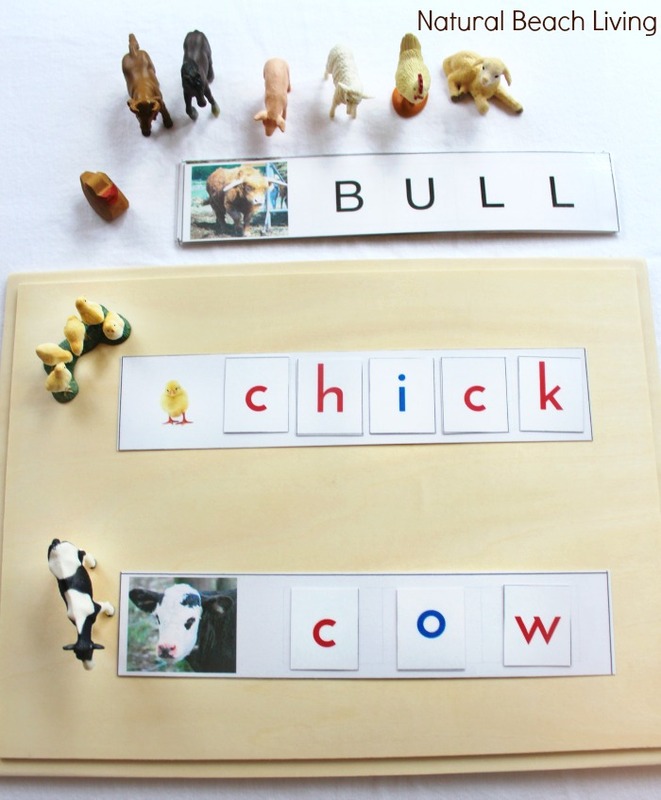 We love the farm animal toob and farm babies to match the word card. In fact, I think we love all of the Safari toobs because they are little and can be used for so many different activities. 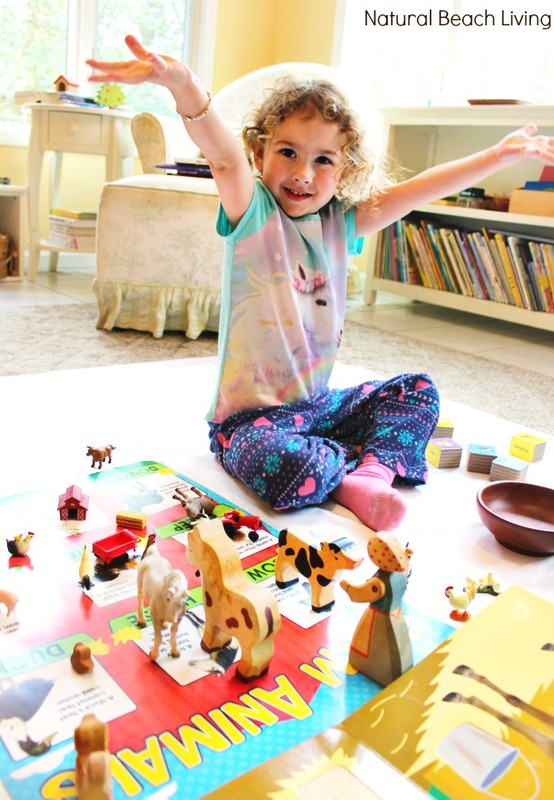 Bells loves playing and learning with her farm animals. 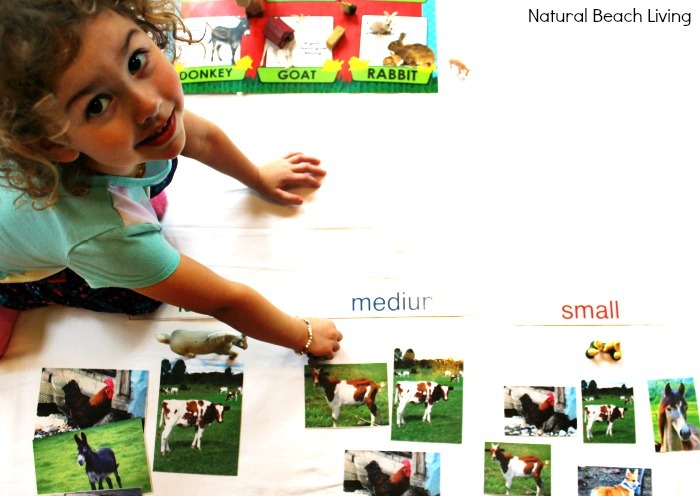 She has spent the day reading farm books and matching her animals to the poster. We’ve enjoyed learning facts about farm equipment and working on a farm. 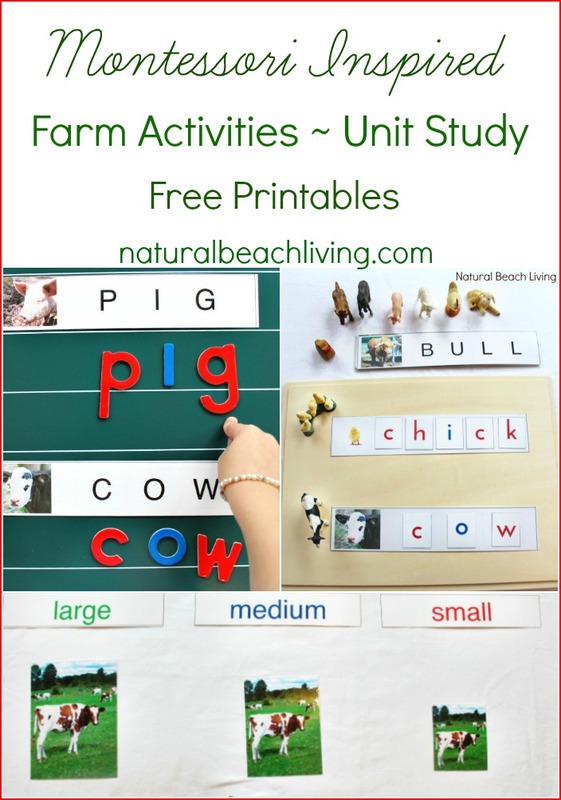 You can use the picture printables or gather several farm animal figures in a bowl and use the actual animal figures. We did both. 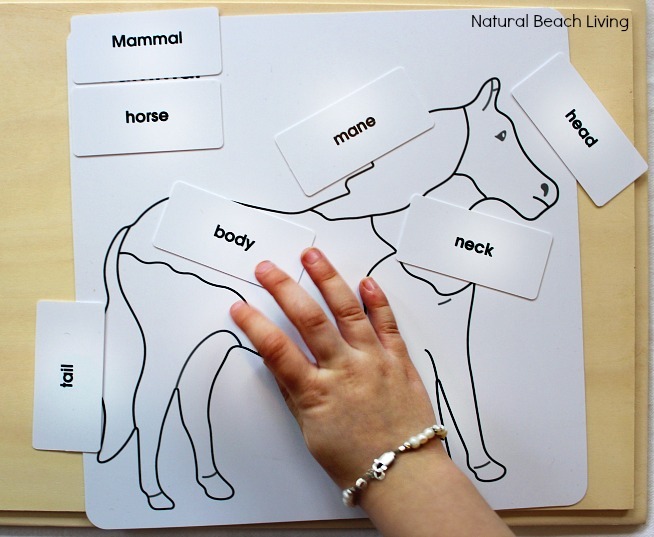 This Montessori Animal Puzzle Activity is so much fun! Bells loves working on the parts of animals. 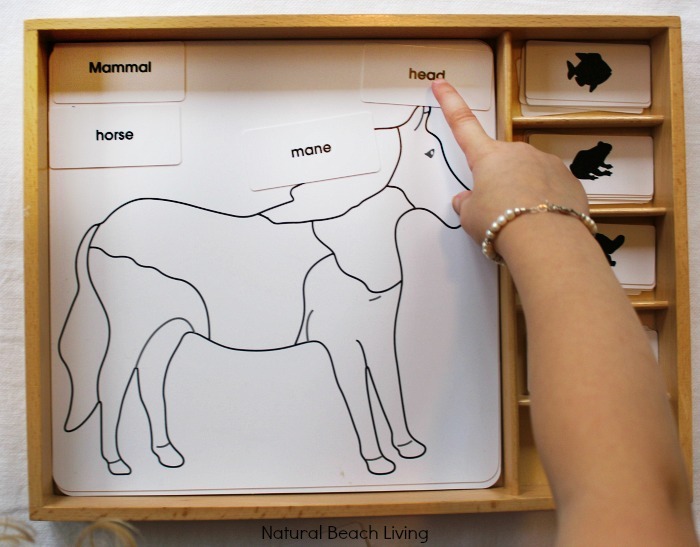 I have included a horse printable with a control chart that your child can label in the free pack below. I hope you enjoy these Farm Activities as much as we do and can incorporate some of them into your learning. You can check out some of the other Farm Ideas we’ve shared below. Next stop the farm to pet animals. What a great resource! My daughter loves farm animals and all things letters. Perfect timing!